Anna: The recipe I tested is from Good Housekeeping - I chose it because it was simple and required only ingredients I personally always have in my kitchen. Plus, it was so funky I HAD to try it, and luckily that worked out. I made my house around Halloween and decided to take advantage of the spooky goodies I could only get at that time of year. Y: I tested a Scandinavian recipe from The Great Scandinavian Baking Book. I chose a Beatrice Ojakangas' recipe because I love her book, and usually have great success with her recipes. I was also attracted to the ingredients she had in her gingerbread. If you're using this recipe, please be aware that in general, gingerbread for houses are usually designed less for taste and more for it's ability to be sturdy and long lasting. My house is titled, "Steve the StormTrooper comes home for the Christmas holidays". Anna's Notes: If you don't have an awful lot of time, the doughs can easily be frozen and then thawed when you are ready to roll it. The baked pieces can also be tightly wrapped in plastic and frozen for assembly later. I didn't make the simple syrup, because I couldn't be bothered, but it's included as an added option for other people to try. Instead of using the syrup as glue, I just used the royal icing above. 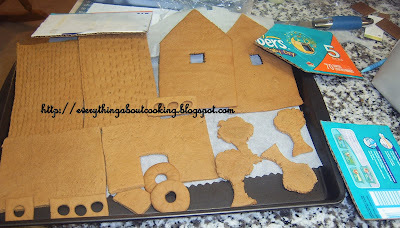 My house is quite small, so it held well together very easily, until the royal icing dried. The amount of royal icing you will end up needing will of course depend on whether you use it purely for decoration, or also as the 'glue' for the house. We feel that by having these simple ground rules in place but giving you the freedom to run with the challenge otherwise, anyone with a few hours of free time this month can tackle this. And if you have a bigger chunk of time, you can REALLY tackle it. Preparation Time for Anna's Recipe: 10 minutes to mix the dough, 4-8 hours at least to chill it, then 5 minutes to roll, 10 to rest, and 10 to cut. Another 30 minutes to rest, if necessary. 25-30 minutes to bake, depending on the size of the pieces. I would estimate 2-4 hours to decorate, depending on how ornate you want to make everything. It could certainly take longer if you are doing a lot of intricate royal icing designs or making your own candies. Altogether, this will take 7-13 hours, including chilling time. But, as noted above, you can break this up over several days or even a couple weeks if the freezer is utilized.